On June 21st Collectors Kingdom will be hosting a signing during their summer sale. Pronto comics will be signing copies of Pawn, Myth vs. Zombies and Comicly Absurd Comics. They will also be selling special, limited edition t-shirts and doing sketches! 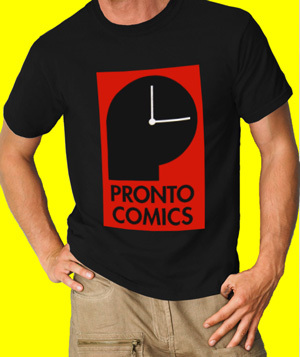 Pronto Comics is now taking orders for t-shirts. There will be 4 different style: the standard black with logo, logo over the breast pocket and baseball shirts in 2 colors – red and black. 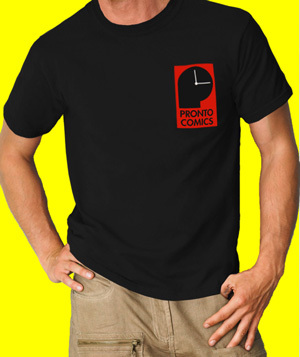 Printing will be done by Five Star Printwear and a previous Pronto Comics collaborator Gary Cohen. 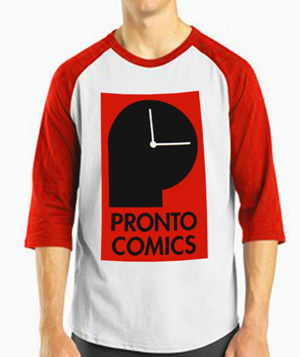 If you’d like a t-shirt please email Editor-in-Chief Dominic Sparano (eic@prontocomics.com) and you can paypal the money (shirts are $18) to prontotreasurer@hotmail.com. Finally don’t forget about our upcoming event, Phrases to Pages. If you’d like to know more, check the link and we’ll see you on the 28th! I am pleased to announce that Pronto Comics is hosting its first fundraiser, entitled “Phrases to Pages” at Pearl Studios, 500 8th Avenue, on Saturday, July 28 from 8 p.m. to 11 p.m. The event will feature contests, industry guests, refreshments, music, and more, including free drinks sponsored by Brooklyn Brewery and Casa Herradura Tequila. Bring your portfolios and scripts, as Pronto Comics will also be reviewing portfolios and scouting for new talent. Contests will consist of writers and artists pairing off, being given a mystery phrase, and drawing and writing one comic book page based on the phrase. Special guests from the industry, including Simon Fraser and Ken Knudsten (plus more names to come) will judge the winner. Winners will receive prizes! Please note, this event is 21+ only. Entry is only $10. Funds raised from Pages to Phrases will help in the operating costs of Pronto Comics and will allow Pronto Comics to continue to provide services for everyone working to develop their comic book career. RSVP on Facebook is requested but not required. 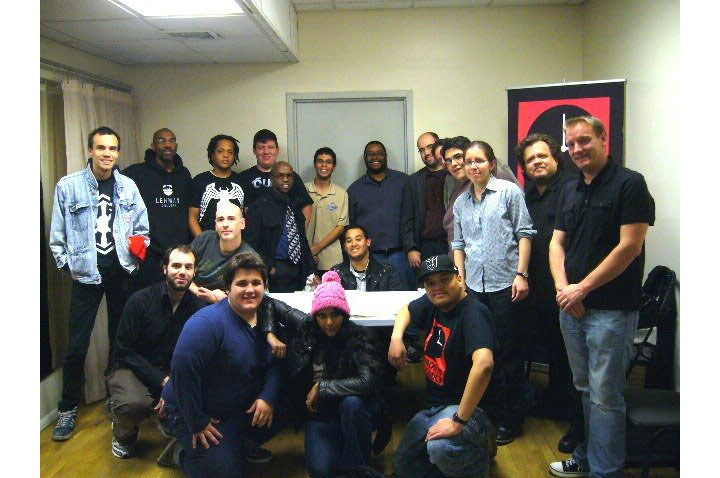 During our September meeting, Brian Smith, a former Marvel editor, freelancer for Nickelodeon, and creator of Stuff of Legend and Intrepid Escapegoat, came to talk to Pronto Comics. He offered advice on breaking in, staying in, small publishers, conventions, promotions, and good city colleges to attend. His advice was well received and Pronto was lucky to have him. Put your work out there. Constantly network cause you don’t know where it will take you. You have to make people aware of your work. The more you know how to do the better. Send a letter first, a query letter. Physical, snail mail letter is best. Breaking in as a writer is a nightmare. They won’t read a pitch, but they will read a comic. You constantly have to prove yourself. Everyone is only interested in your last project. When you’re working with other people, just do your job. Don’t overstep your role and dictate. Give your artist things they like to draw. Be easy to work with, do your best to walk away when it’s done. Editors are involved, but are hands off. They’ll help you generate ideas and connect the dots. Not-so-good ideas can have merit, if executed well. Find good, honest sounding boards for your ideas. Life drawing will lead to everything else. Always look at original art when you can. Go to work, even if you don’t feel like it. If you can treat it as a 9 – 5 job, that’s half the battle. If you can put the time in, everything else will fall into place. You’ll figure out your schedule as a freelancer. Self publishing and small publishers are a good way to go. Small publishers are more personal and hands on. Digital is a good way to go. Free Comic Book Day is huge for small publishers. Develop relationships with store owners. They can help recommend you book to customers. Pick the conventions carefully for what you want to get out of them. San Diego is a massive show and a tough show to work. N.Y. is similar, but there are more editors. Hero’s con in Charlotte is good, so is Baltimore.